The rising cost of going to university is a growing concern for parents, with tuition fees having been hiked over the past decade. 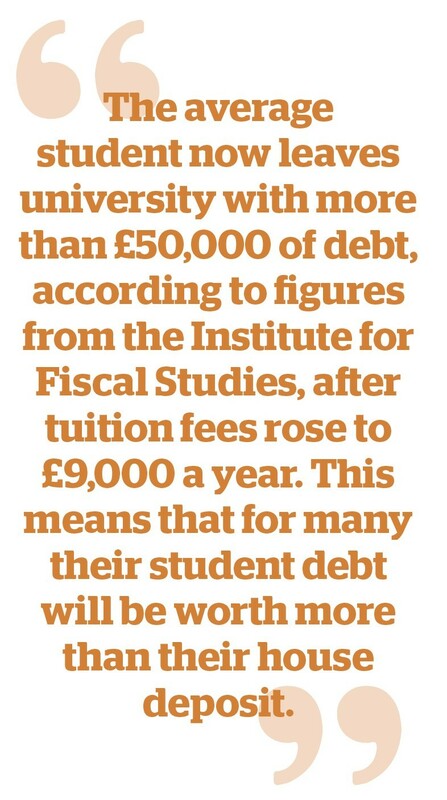 The average student now leaves university with more than £50,000 of debt, according to figures from the Institute for Fiscal Studies, after tuition fees rose to £9,000 a year. This means that for many their student debt will be worth more than their house deposit. But how can parents save up and invest so their children leave university with no debt? By using a Junior ISA, which can be opened for every child from when they are born, parents can put away money each year and end up with a sizeable pot. As with adult ISAs, any savings in the Junior ISA will grow free of capital gains tax and any withdrawals will be free of income tax. However, when the child reaches the age of 18 the ISA becomes theirs and they can do whatever they want with it – including splurging it down the pub or on a car. Research from AJ Bell recently found that only 7% of Junior ISA holders cashed out their accounts when they reached the age of 18. It’s not clear whether that number is because their parents hid the account from them or if they chose to stay invested themselves. Parents who manage to remember to open a Junior ISA during the busy, sleep-deprived first weeks or months of having a newborn baby will benefit from a longer time period for the pot to gather returns, and from having to contribute smaller amounts each year. Someone who opened a Junior ISA in the first year of the child’s life will need to pay in £1,900 a year until they reach age 18 to get to the magic £50,000 figure. Assuming 4% growth after charges each year, they would end up with a pot of £50,675 on the child’s 18th birthday. If you have more disposable cash and want to put in the full Junior ISA allowance (we’ve assumed £4,260 each year, although this will increase with inflation) you will need to contribute the full annual allowance for the first seven years of the child’s life. Then you can leave the pot to grow, and assuming the same 4% growth figures, it will reach £53,870 by the time they reach the age of 18. The early years of a child’s life are expensive, from kitting out a nursery to paying for childcare, so it’s understandable that many new parents can’t find the spare cash to stash in an ISA. But if they start saving when the child is five and in school, they need to put £2,900 a year away until they reach the age of 18 to have a pot to pay for university. On the child’s 18th birthday they will have £50,147, assuming that same 4% growth after charges as before. If they start saving when the child is aged five but want to put the full Junior ISA allowance in, they only need to pay in until the child reaches the age of 13, at which point they will have contributed £34,080, which will grow to £49,667 by the time they reach their 18th birthday. What about if you totally forgot to open the Junior ISA, or just haven’t had the spare cash to put money away? Well the good news is that you can start saving when they are eight, put the full £4,260 allocation away each year and still reach the crucial sum by their 18th birthday – when you will have a pot of £53,192, assuming 4% annual growth. Junior ISAs were a replacement for Child Trust Funds, which were phased out in 2011. – Anyone under the age of 18 who is resident in the UK can have a Junior ISA opened in their name. Only the parent or legal guardian can open the account, but anyone can pay into it. – The current Junior ISA allowance is £4,260 for the 2018-19 tax year, when it will rise to £4,368 for the 2019-20 tax year. – You can have either a cash or a stocks and shares Junior ISA – or you can have both. You’re allowed up to one of each per child, and you can pay into both in the same tax year. – Any money in the ISA will grow free of capital gains tax, and any withdrawals will be free of income tax. – The money in a Junior ISA can’t be accessed until the age of 18 – when it’s usually transferred into an ‘adult’ ISA and the teenager takes control of the money.